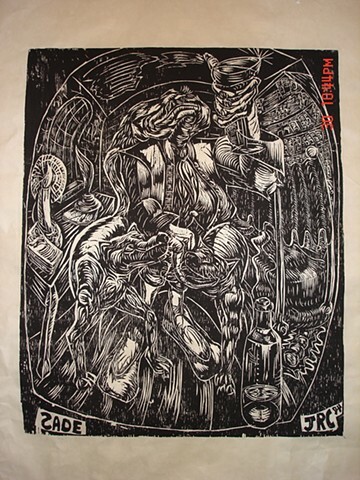 One of a series of large woodcuts I did while getting my Masters degree at the New York Academy of Art. I read a fantastic biography of this infamous Libertine, author, playwright, and director of asylum inmates. I was fascinated by his time spent at the Bastille in Paris where he kept two dogs, had special meals brought in and had various sexual implements custom made and sent there. He wrote "120 Days of Sodom" while there. It was written on a continuous roll of paper which was hidden in the wall. When the Bastille was liberated, he fled, but left the manuscript behind. It wasn't found until the early 20th century when it was published to much fanfare and attendant scandal. Even almost 200 years after his death, he would be dragged back into court because of his writings.